You can book, change or cancel your gas grill repair appointment at any time online or over the phone. We’ll update you about your grill repair appointment via text, email or phone–whichever you prefer. Protect all your home’s appliances and systems. Ask your tech how you can save with a Home Warranty. QUIZ: What’s Your Garden Design Style? Whether you have a backyard gas grill, built-in grill or even an outdoor grill island, meals are always more enjoyable when using a BBQ grill of any type. Chances are, your grill still has a lot of life left in it. Most grills will last a good 10 years or more. Whatever brand or type of grill, our team has the experience to resolve the issue. If your grill doesn’t have a robust flame, it won’t get hot. Any one of a number of things can cause a low flame. For example, there may be a problem with the control valves, the venturi tubes or the regulator. 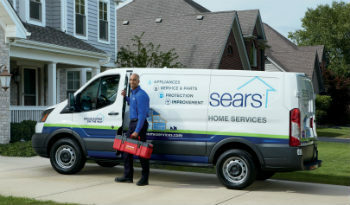 Whatever the problem is, your Sears technician will have it up and running in no time. This problem is bothersome, especially when you know you have plenty of propane in the tank. The ignitor issue may be as simple as burner tubes needing to be cleaned or needing a new igniter kit. A professional service technician will be able to diagnose the problem and repair it for you. Your grill’s flame should be blue with yellow around the tips. If the entire flame is yellow or orange, this indicates a problem. It may be related to the venturi tubes or venturi shutters. The gas comes through the tubes and mixes with oxygen before heading out to the burner ports where you see the visible flame. A Sears service technician will check this and determine the cause. If your grill is heating only on one side, you may be able to get by with this issue for a while, but you’ll want to have this repaired so you can enjoy more efficient grilling. Often, the reason you have uneven grill heat is a clogged or blocked burner. The Sears team of technicians are skilled at determining just what is blocking the burner and clearing it out for you. If you have a problem with your gas grill, it may just need a quick fix from a pro. The Sears Home Service technicians are standing by, ready to assist you with your grill issues today.